During January, the Church celebrates the Baptism of Jesus in our liturgical year. 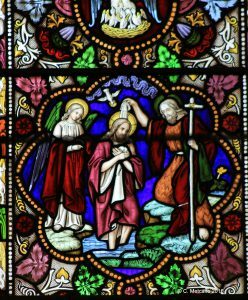 Jesus was baptized as an adult, by his cousin or kinsman, John the Baptist, according to the Gospels of Matthew, Mark and Luke. He was baptized in the river Jordan. The Holy Spirit appeared like a dove, and the voice of God was heard saying ‘This is my beloved Son in whom I am well pleased.’ The event is referred to more obliquely in the Gospel of John. The Baptism is seen as the start of the Ministry of Jesus. There are two images of the Baptism of Jesus in St Swithun’s Church. One is in the Chapel of the Nativity, to the left of the main altar. 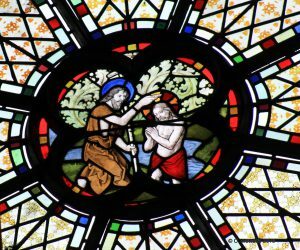 In the right hand section of the East window in this Chapel there is an image of the Baptism in a roundel within the beautiful blue glass. It is believed that this window was rescued from a mansion destroyed in Ballina, County Mayo, in the 18th or 19th century, and eventually brought to St Swithun’s in the 1930s, when the old organ was removed from this part of the church. The other image can be found high up in the clerestory window nearest the back of the church, on the left hand side as you face the altar, next to the organ pipes. The clerestory windows on the north side were installed in the late nineteenth century. The central scenes were probably installed later. 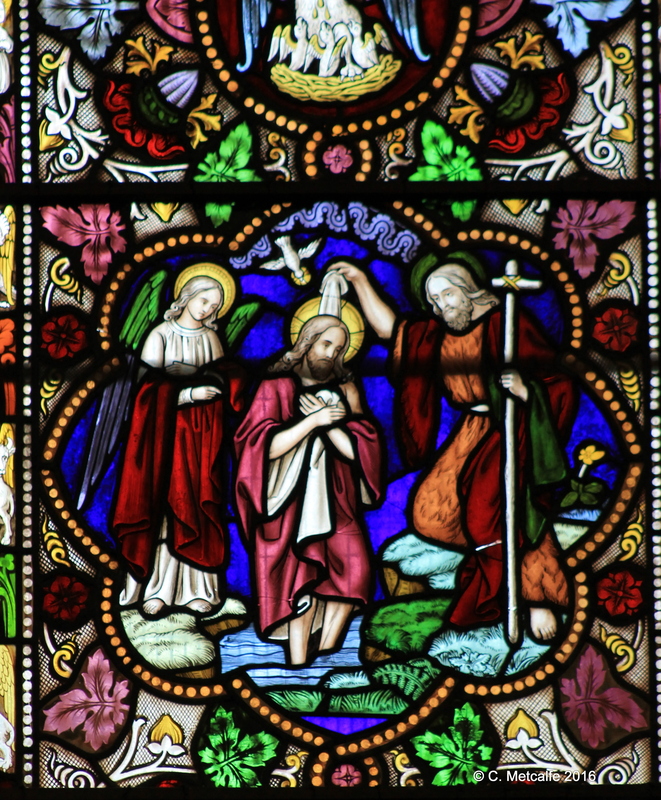 The five windows have central scenes portraying: the Baptism of Jesus, the Call of the Apostles, the Transfiguration, the Agony, and Bearing the Cross. There is some decoration in the surrounding panels, but I do not see any animals in the panes on the north side, whereas the heads of three dogs, a cat, and a flying Guinea pig can be found in the clerestory windows on the south side.